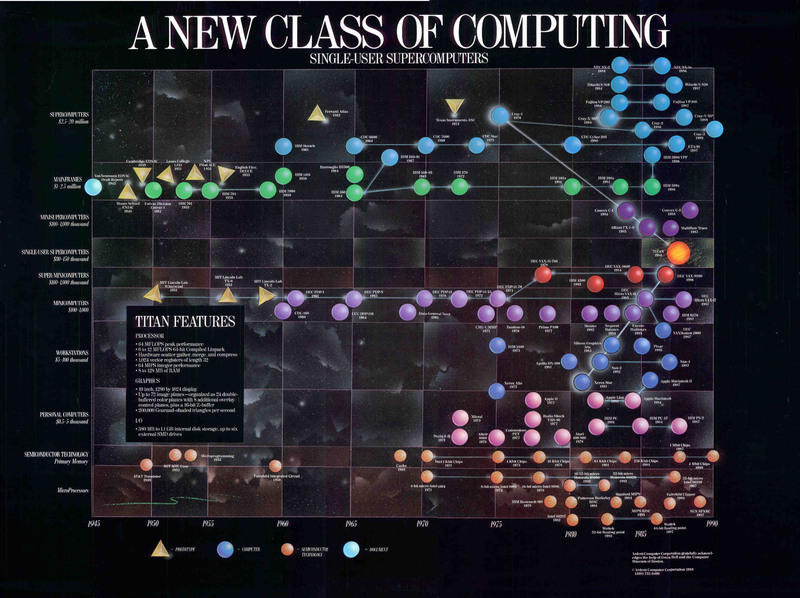 In 1985 Ardent Computer was determined to create a market niche for personal supercomputers. To understand our potential markets, we started by analyzing the marketing literature from Cray Research then crisscrossed the country talking to prospective customers – scientists and researchers in advanced corporate R&D centers and universities – to understand their needs. A week might start with a visit to the MIT Media Lab, the next day at Princeton in the Aerospace Engineering department, then off to General Motors’ advanced research group, across to the computer science department at the University of Illinois, up to Minneapolis to meet with ETA, Control Data and Cray, and across the country to Seattle to speak with Boeing’s advanced propulsion group before returning to to the geophysics department at Stanford. After six months, we hypothesized that our most likely customers were scientists and engineers who used one of five applications: computational fluid dynamics, finite element analysis, computational chemistry and seismic data processing and reservoir simulation. At Boeing we had learned aircraft designers needed to calculate the airflow and turbulence around wings and engines. Instead of building a new wing to test designs, numerical simulation would allow them to use a supercomputer to build a virtual model of a wing on the screen and use an application called computational fluid dynamics to watch the resulting airflow without ever flying a plane. If they didn’t like what they saw (say the wing had more drag than expected), they could change the design and rerun the simulation. At General Motors we heard from mechanical engineers who needed to calculate the strength, breaking point and failure modes of structures – everything from piston rods to bumpers. Their interest was easy to understand. Before computer simulation, they would test real objects until they physically broke (or get sued when something important broke, blew up, or collapsed.) Now applications called finite element analysis could calculate these stresses and failure modes on a computer screen. A third simulation market, this one new and just emerging, allowed biologists to examine how drugs would interact by simulating them on a computer. A precursor to today’s biotech revolution, these computational chemistry applications allowed the active docking sites of potential drugs to be modeled and tested on a computer screen rather than in a test tube. Finally, we could see that petroleum engineers at oil companies like Chevron and Exxon were using computers in exploration and extraction with seismic data processing and reservoir simulation, applications which were moving oil companies into the supercomputer age. Traveling around the country had helped me begin to understand how these customers currently did their work, what journals they read, where they got their funding, what other software they ran on their machines, etc. I came back to the company and described the day-in-the-life of each type of customer. I believed that good marketers used their own products. I got facile enough with a few of the applications that I could even run some of them myself. I could build simple finite element models with Patran and set up a run of the Nastran analysis codes. To sell to customers you need to understand them: how they work, what they do and what problem you will solve for them. You can’t understand customers from inside your building. I am on the front lines of that battle right now. Awesome story so far–inspiring for aspiring marketers. I’m loving this series, but have just one little nitpick. You mentioned in the previous post that you basically used Cray’s (public domain) information to compete against them. Yet every source of advice for startups advises against being too protective of the company’s mission and plans. Clearly, the situations are not totally comparable, but do see situations where startups should be careful about not giving too much information away?